My post of 3rd January 2019 referred to the inclusion of photographs by Joan Leigh Fermor in Paddy’s translation of George Psychoundakis’ The Cretan Runner (1955). The book has been reprinted in hard back and several paperback editions; the Folio Society published an edition in 2009. The 1988 reprint of the 1978 paperback has 14 photographs credited to Joan. These include six head and shoulders portraits, two full length portraits, three village scenes and three landscapes. 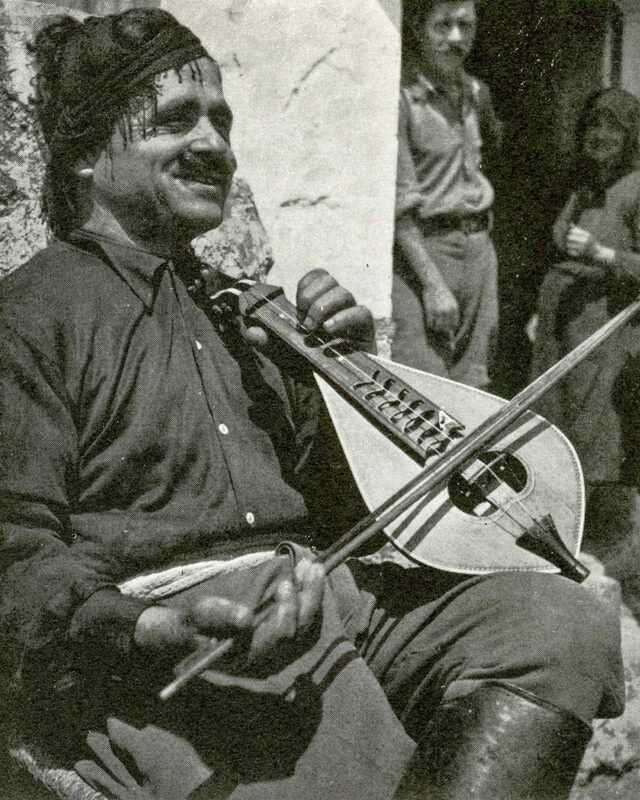 The Folio edition includes 10 of the same pictures, some with a slightly different crop, and an additional picture of PLF with Manoli and Vardi Paterakis. The best of the portraits, e.g. Nikoli Alvizakis, George Psychoundakis and Father John Alvizakis, are relaxed and well-composed, with the low viewpoint dictated by the photographer’s Rollei giving them a nobility suited to the participants in the extraordinary events chronicled in The Cretan Runner. Some of the other portraits are stiff by comparison. The landscapes capture well the ruggedness of the terrain over which the resistance campaign was conducted. The quality of the printing in the 1988 reprint is variable, at its best quite acceptable, but too often being either too contrasty or too flat. The Folio edition prints are generally better. A few of the pictures and others taken at the same time are included in The Photographs of Joan Leigh Fermor Artist and Lover (Haus 2018) and show the rich range of tones Joan was able to achieve in her photography. The Cretan Runner reveals again how poorly she was served by her early publishers. The credits in the Folio edition say ‘All photographs courtesy of Patrick Leigh Fermor.’ I think that’s a discourtesy to Joan Leigh Fermor. This entry was posted in Joan Leigh Fermor. Bookmark the permalink.